Napoli's 3-0 win over Fiorentina may not earn them a place in the Top 4 of the Serie A, but would provide as morale booster going into Thursday night's 1st leg quarter-final clash with Wolfsburg SV at the Volkswagen Arena. Goals from Dries Mertens, Marek Hamsik and Jose Callejon meant that the Partenopei are armed with more scoring options besides their mainstay, Gonzalo Higuain. The ability of the likes of Hamsik, Dries Mertens, Jonathan de Guzman, Manolo Gabbiadini, Callejon and Higuain to combine and create spaces could be a threat to a Wolfsburg defense that has been caught on the wrong foot on many a occasion. The German club is lucky to have got off lightly considering their sloppy defending in the Europa League games but they have more than made up for that deficiency with some serious attacking verve. Their ability to create openings with long and short passes, shift from a defensive mode to an attacking one with lightning speed and a knack of finding gaps in rivals' defenses make them a frightening opponent. Bas Dost with 13 goals this season, the mercurial Kevin De Bruyne (5 goals and 5 assists), the seasoned Andre Schurrle upfront and Luis Gustavo's phenomenal interception skills will be the key to Dieter Hecking's 4-4-2 game against Napoli. Rafael Benitez on the other hand will be depending heavily on the club's Argentinian talisman, Gonzalo Higuain. The Argentine has been Napoli's highest scorer with 23 goals from all competitions and is expected by the club fans to be the man who can deliver.The Partenopei are into the quarter-finals for the first time since 1989 when they won the title under the legendary Diego Maradona. Despite being winners of the Coppa Italia in 2012 and 2014 their performances this year have been highly inconsistent fluctuating between absolute brilliance and the abysmal. Their win against Fiorentina broke a winless drought of seven matches and they have lost all their last four away games.Their tendency to let in goals is high,too, having conceded as many as 37 from just 29 outings and they will be running into an opponent averaging two goals per match. With both teams possessing an attack-oriented bent of mind, there could be plenty of goals in store in the coming two legs of this clash. 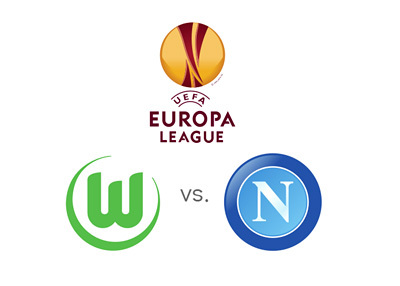 So far Napoli's 16 encounters with German clubs have fetched them just 4 wins and their track record on German soil does not bode well for their game at the Volkswagen Arena on April 16 night. The statistics read Win 0, Draws 3 and Defeats 5. Although it's Napoli unpredictable streak that will keep the followers of 1st leg clash on the edge, the potential Bundesliga runners-up are expected to prevail. Despite both teams being title contenders, bookmakers are looking at Napoli's away games history and Wolfsburg's distinct home advantage in ascertaining odds.